OJ287 is an interesting blazar. Typically a blazar is caused by a supermassive black hole in the center of a galaxy that is aligned so that the axis of rotation of the black hole points in our general direction. When the black hole is in a period of actively absorbing surrounding material (making it an active galactic nucleus, or AGN) it emits powerful jets from its poles. Since it is pointed in our general direction, we see an intense emission of energy known as a blazar. 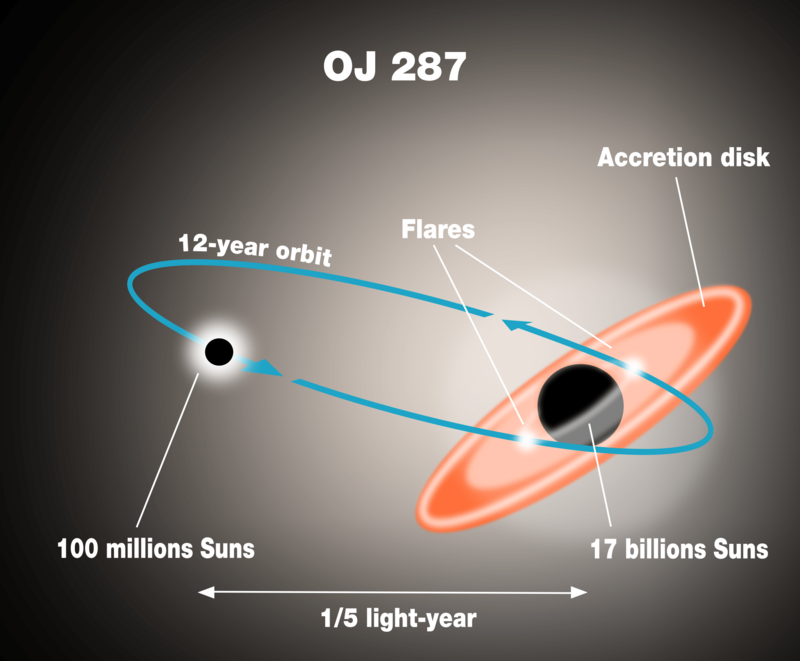 OJ287 is different because it varies in brightness over a period of 11 – 12 years, with a sharp double spike in brightness when near maximum. Analysis of this variability during the 2005 outburst showed that the variation was due to a massive black hole of about 100 million solar masses orbiting a black hole of about 17 billion solar masses. Because the two are orbiting so closely, the smaller black hole intersects the accretion disk of the larger black hole, causing the characteristic double spike in the brightness. You can see how this works in the figure below. Both of these black holes are unusually large. By comparison, the supermassive black hole in our own Milky Way galaxy is only about 4 million solar masses. The “small” companion in OJ287 is 25 times larger than that. The large companion is the largest known black hole in the universe. There’s a certain amount of uncertainty to those measurements, particularly the larger one, because of the limited number of periods that have been observed. The blazar was first discovered as an intense radio source in a radio sky survey in the early 1970s, so there has only been about 3 periods to observe it. But this is where things get interesting. Although OJ287 was discovered in the early 1970s, we actually have data on it dating back to 1891. That’s because it not only gives off intense radio waves when it flares up, it also brightens in the optical range. Although it wasn’t noticed as an object of interest, it would show up on photographic plates. So we actually have optical data on it for more than a century. In a recent article in Astronomy and Astrophysics the authors did a bit of historical detective work. They studied photographic plates from the Harvard College Observatory, and found photographic images of OJ287 during its peak brightnesses of 1900 and 1913. From the plates they were able to gather about 500 historical data points. This was enough to determine the light curves of both events. By comparing these century-old observations with modern observations, the authors were able to demonstrate that OJ287 is quasi-periodic. It has a roughly 12 year cycle, but not a fixed period. If it were a fixed period, then that would be evidence that the brightness cycle is driven by the orbit of the companion. But instead there is evidence that things are more complex. This complexity seems to be due to the fact that the central black hole is rotating. This causes the orbit of the smaller black hole to precess through a process known as frame dragging. Given the size of the central black hole and the fact that black holes tend to rotate, this isn’t unexpected. There was in fact a model proposing this very effect in a 2010 paper. This new historical data supports that model. The Harvard College Observatory has about 500,000 photographic plates spanning 120 years of observation. That’s a lot of data that can be mined for historical observations. Nice, OJ287 is one of the objects that always catches my attention when there is new information about it. This paper is informative and questionable at the conclusion to me, I am just a lamen and I am trying to expand my knowledge or horizontal lines of the universe. Thanks for your help in getting to know more about the position and Implications that Stars and Moons play in our universe, again friend Thank you! !Geronimo Dudley??? ?